A geoprocessing model is composed of model elements that are connected to form processes. You can add geoprocessing tools, data, and other elements, connect them to each other, and modify the elements' size and position. Drag and drop datasets such as feature classes, tables, and rasters into ModelBuilder from the Catalog pane. Drag and drop map layers into ModelBuilder from the Contents pane. When working in ModelBuilder, the Contents pane lists layers from the last active map or scene. When you add data to a model, a data variable is created as a blue oval. Data variables contain a description of the data, not the data itself. ModelBuilder stores descriptive information about the data in the variable, such as spatial extent, field information, and coordinate system, as well as the path to the data. The name and data type of the variable in the title bar. The value of the variable in the Value tab. You can change the value here. Some variables will have a Properties tab, on which you can set a Template layer that will be used to symbolize the data when the variable is added to the display, and is also used to specify the shape type, symbology, and other properties of feature set variables. Start typing directly in ModelBuilder to open the Add Tools To Model dialog and search for a specific tool. Double-click the desired tool to add it to the model. Use the Tools menu in the Insert group of the ModelBuilder tab to search for a specific tool, and double-click the desired tool to add it to the model. Drag and drop geoprocessing tools into ModelBuilder from the Geoprocessing pane. Drag and drop geoprocessing tools into ModelBuilder from toolboxes in the Catalog pane. Drag and drop geoprocessing tools into ModelBuilder from Geoprocessing History. When you add a geoprocessing tool to a model, a rectangular tool element is created, as well as related output variables. Both the tool and the output variables are typically gray when added, as the tool is not yet ready to run. Once the required tool parameters are specified, the tool changes to yellow, indicating the process is ready to run. 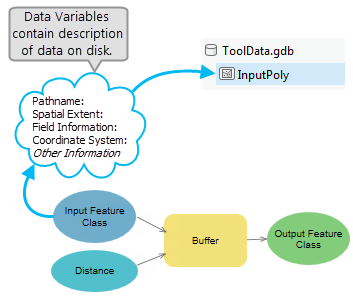 You can specify the data or other parameter settings for a geoprocessing tool to use by making a connection between the variables and tools in the model. There are two primary ways to make connections: draw a connection interactively, or open the tool in the model and specify input parameters using model variables, map layers, or browsing to a dataset. You can connect any variable to one or many tools. Place your cursor over the variable that you want to connect to a tool. The cursor changes to the connection icon . Click and hold the left mouse button while you move the cursor to the tool to make a connection. When the cursor is above the tool, release the mouse button and select the tool parameter to which the variable should be connected. A connection is made between the variable and the tool. To specify the parameter settings for a tool in the model, double-click the tool or right-click and select Open. You can specify parameter settings for the tool just as you would when running a tool in the Geoprocessing pane. Select map layers or model variables from a list. Fill in the parameter using other controls such as Extent or Query Builder. Right-click the tool in the model and click Create Variable > From Parameter then select the tool parameter by name for which you wish to make a variable. Insert a new empty variable using the Variable button in the Insert group of the ModelBuilder tab, select the appropriate data type for the tool parameter, specify the variable value, then manually draw a connection from the variable to the tool parameter. To resize any model element, select the element and drag any of its handles. To move any model element, select it, hover over the middle of the element until the move cursor appears, then drag the element to any location in the model. The default names of tools and variables are automatically generated by ModelBuilder when you add the element. If the element name already exists in the model, it is appended with a unique number. To rename any model element to a unique name, right-click a model element and select Rename then type in a new name and press Enter or click outside the rename box. Changing the name of a variable does not affect the contents, dataset, or value of the variable. For example, a variable references the value C:\Data\Example.gdb\Roads. Renaming the variable name from Roads to Streets does not change the dataset path, only the variable name. Double-click the tool to open it, or right-click the tool and select Open. Both the new name of the tool and the original tool name will display in the title bar of the dialog box, for example, 100m Road Buffer: Buffer.